No matter what the polls say, Gay Byrne should not be the next president of Ireland, for one very simple reason – to elect him would be to rubber-stamp a system of politics that has reduced our democracy to a simple, rigged popularity contest. I am not suggesting for one second that he wouldn’t be a good representative for the Irish people – far from it. A conservative gent who has been ruined not once but twice by idiots who purported to be financial experts, it could be argued that he is the perfect person to represent Ireland at this point in time. Gay Byrne should not be elected our president because at a time when we face a deeply uncertain future, he represents the past. In his prime, there was no other broadcaster in the world who could match him. A professional in every aspect of his being, he managed to create intimacy with his guests despite not possessing the human warmth of some of his rivals. The fact that he put issues like sexuality on the Irish agenda for the first time through his radio and television shows is a cliché worth repeating. But despite the great debt of gratitude we owe him, the presidency of Ireland is not a prize to be awarded for his services to broadcasting. It is a constitutional responsibility that grows more important by the day. At 77 it’s hardly unfair to say that his best days are behind him and, judging by his leadership of the National Road Safety Authority, anyone hoping for a political Arnold Schwarzeneger effect from Uncle Gaybo will be sorely disappointed. Having left his morning radio show and the “Late Late”, he has quickly become an irrelevance, not least to the generation of voters who will be voting for a president for the first time. What these voters – and Ireland – need in the Aras now is something to set us apart, both politically and in the eyes of the watching world. Politically, we need someone independent of and untainted by the existing political mafia, a voice not indebted to the gombeens in the shebeens who were the architects of our spectacular rise and subsequent sickening fall. If ever there was a chance to send a message to the whips and the spin doctors, this is it. No more old politics. From our new president, we need a combination of energy, intellect and sensitivity to lead the people as we try to regain our self-confidence and re-establish ourselves. In the eyes of the rest of the world, we need a hard-nosed and dynamic presence that can sell Ireland and the Irish to investors and students alike, someone who can fill the citizens with wonder about our green and pleasant land to the extent that they want to find out more, spending their money here in the process. For despite the very high opinion we have of ourselves, the rest of the world barely sees us at all, and what it does see it doesn’t like at the moment – a nation famous mostly for intoxicating substances and debt. For our recovery to gain momentum, this has to change. David Norris could have been that presence, as he is ostensibly everything that Ireland is not. Gay Byrne cannot be that presence, in part because he played such a role in creating the old Ireland we wish to leave behind us, and it says a lot about the devious nature of the Fianna Fáil party that they would consider asking him to run. Following the deserved kicking they got at the last election, they know they are a beaten docket- unless of course they pull the kind of lowbrow political stroke that supporting Gaybo would represent. His election with their support would somehow allow them to fool themselves into thinking that had been forgiven for ruining our country. They should never be forgiven. We should never forget. 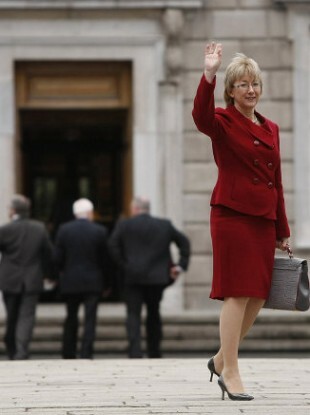 Even more amusing is the staggering lack of self-awareness shown by the reprehensible Mary Hanafin, one of the chief architects of Fianna Fail strategy who according to reports is considering making a run for the presidency. With her party’s record in office and the state they left their country in, it is both surprising and disappointing that the bottle of whiskey and the shotgun so beloved of Vincent Brown remain as yet untouched. Dana, Michael D Higgins and Gay Mitchell are a trio of laughable alternatives that only go to show that is no serious candidate in the race at the moment; what is so disappointing is that the calibre of those named in connection with the presidency is so low. This is not because they don’t exist- our last two presidents have been outstanding – but because the political system and the parties that operate within it have become so consumed by the hubris of the last ten years that the political careers of any outstanding candidates were drowned at birth. Either we start a serious search for someone with the style and substance to represent us at home and abroad and beg that person to run, or we change the constitution and create a new TV series called “Celebrity President” and turn the whole thing into a phone vote. Somewhere out there, there has to be a John Hume or a Gordon Wilson, or a Robinson or a McAleese who hasn’t made a phone call or written a letter to Israel, who has paid their taxes and likes the church just enough to keep the conservative Catholics onside, but not enough to let them keep on abusing children. Somewhere out there, there has to be someone whom we can elect to say to the rest of the world, “this is who we are, and this is what we have to offer”. Somewhere, there has to be someone with the humility and the sense of duty to do this job not for themselves, but for us. At the moment, our efforts to find that person appear to have gotten as far as “B” in the phone book, and stopped.